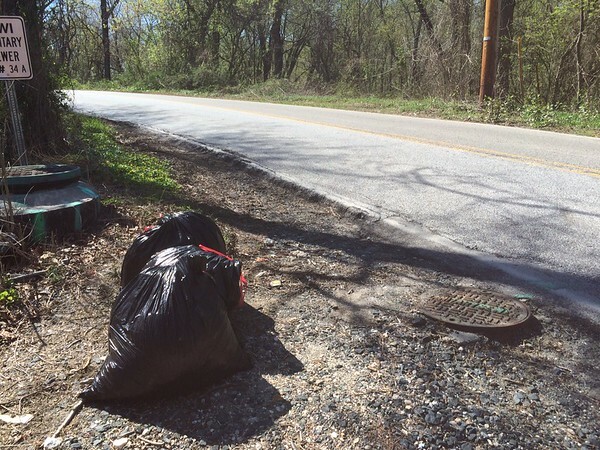 4/18/2015 Jon Merryman, Stoney Run Watershed, AA county, Pic 2 of 2, Someone dumped a bunch of garbage bags over a 1 mile stretch on Furnace and Ridge this morning. I consolidate them into a few locations - one is at the corner of Ridge and Furnace, the next one is at the BWI sewer line Road and the third is next to the tunnel by the railroad tracks. All on Furnace Ave. Estimated weight 50 pounds total.